Theoretical models posit a number of channels through which openness to international financial flows ought to increase economic growth. However, there is little robust empirical evidence of a causal link between these two variables (see Obstfeld, 2008). If the growth benefits of financial openness are so elusive in the data, is it worthwhile for developing and emerging market economies to expose themselves to the risks associated with financial globalization? This question is clearly a matter of considerable policy relevance, especially with major economies like China and India recently taking steps to open up their capital accounts. The financial crisis has further sharpened the focus on this question as many emerging market economies have been caught up in the turmoil. This will no doubt lead to a re-evaluation of the costs and benefits of financial globalization once the dust settles. Interestingly, while many empirical studies have looked at the impact of financial openness on GDP growth, far less attention has been paid to its impact on productivity growth. There are at least two reasons why this latter relationship is of interest. First, there is strong evidence that productivity growth is the main driver of long-term per capita income growth (see Hall and Jones, 1999). Second, a new literature proposes that the main benefits of financial openness may be indirect and unrelated to the quantum of net capital inflows. Instead, financial openness matters because it has the potential to catalyze development of the domestic financial sector, improvements in institutions, and better macroeconomic policies. These factors should improve allocative efficiency and, by extension, total factor productivity (TFP) growth (see Kose et. al, http://www.voxeu.org/index.php?q=node/280). In new research, we examine the relationship between financial openness and TFP growth using an extensive dataset that includes various measures of financial openness and covers a large sample of developed and less developed countries (see Kose, Prasad and Terrones, 2008). Our total factor productivity measure is derived from a standard growth accounting framework. To measure financial openness, we employ both de jure and de facto measures. While the de jure measure is based on the extent of restrictions on capital account transactions, the de facto measure is more of an outcome based indicator of integration based on the ratio of gross stocks of external liabilities to GDP. This distinction is important because countries with capital controls may still experience large inflows and outflows, while some countries with fully open capital accounts may in fact have little actual integration into world financial markets. We first examine some basic stylized facts about the relationship between the degree of financial openness and TFP growth. For this analysis, we divide our sample into two coarse groups—more financially open (MFO) economies and less financially open (LFO) economies. The group of MFO economies includes those with above-median levels of financial openness and LFO economies are those with below-median levels. For each of these groups, we show how average long-term growth in output per worker can be split up into the shares attributable to TFP growth, physical capital accumulation (K/Y) and human capital accumulation (H). TFP growth has typically been higher in MFO economies compared to LFO economies over the last four decades. This difference is more pronounced when we focus on the recent period of globalization: 1986-2005 (see figure below). This is of course the period during which there has been a dramatic surge in international financial flows across industrial countries as well as between industrial and developing countries. While physical and human capital accumulation were the largest contributors to GDP growth in the earlier period, among MFO economies the contribution of TFP growth increased dramatically during the globalization period. 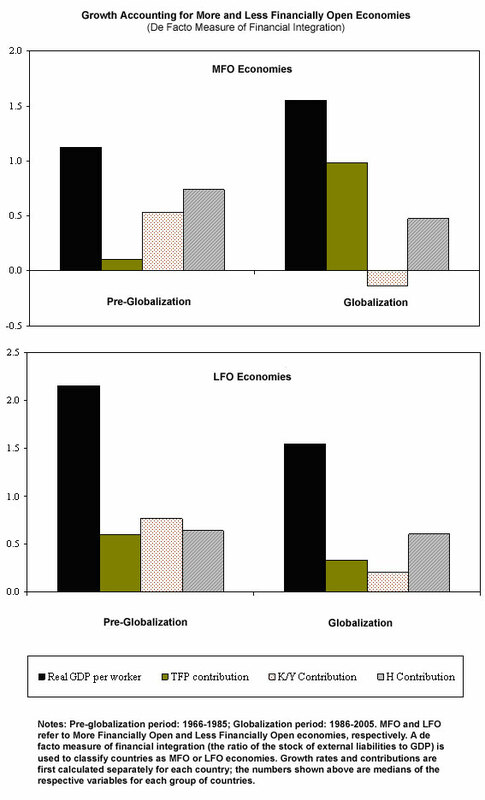 By contrast, in LFO economies, the contribution of TFP growth fell slightly during the globalization period and output growth was mostly attributed to the accumulation of both types of capital. It is also interesting to note that average output growth is rather similar between the two groups of economies during the globalization period, confirming other evidence that there is no clear correlation between the level of financial openness and GDP growth, notwithstanding the sharp differences in the contribution shares of TFP growth. The stylized facts above provide an intriguing hint of a positive relationship between financial openness and TFP growth, although they are based just on averages across time and countries. In the next phase of our analysis, we conduct a detailed econometric investigation of the relationship between financial openness and TFP growth using cross-section and dynamic panel regressions. Our baseline results suggest that financial openness–as measured by de jure openness of the capital account (fewer capital controls)–has a causal effect on TFP growth. This result holds up even after we control for other determinants of overall growth and account for the possibility of reverse causation—that countries with higher productivity growth get more financial flows. Why Are Only TFP Growth Benefits Apparent, Not Output Growth Benefits? How can we square our result that financial openness has a significant positive effect on TFP growth with the existing literature suggesting that the effect of financial openness on output growth is hard to detect? There are several possible reasons for this finding. First, the timing of the adjustment of TFP and output to greater financial integration may be different. TFP growth is often associated with the introduction of new technologies. This could potentially slow down the growth rate of output in the short run, offsetting the growth-enhancing effects of TFP. There could also be some adjustment costs that delay the realization of the positive effects of TFP on output growth in developing countries. Our analysis using macroeconomic data bolsters recent microeconomic evidence (based on firm- and industry-level data) that financial integration, especially if it takes the form of FDI or portfolio equity flows, leads to significant gains in efficiency and TFP growth. Moreover, in tandem with the recent literature showing that TFP growth rather than factor accumulation is the key driver of long-term growth, our results suggest that capital account liberalization does have some real benefits. More research is clearly needed to better understand the specific channels through which financial openness boosts productivity growth—these could include technological spillovers, higher efficiency due to increased competition, and better corporate governance. Obstfeld, Maurice, 2008, “International Finance and Growth in Developing Countries: What Have We Learned?” Forthcoming in IMF Staff Papers.